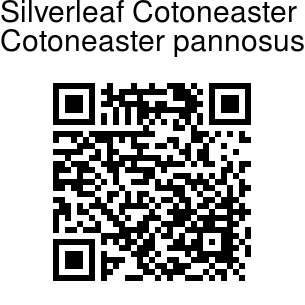 Silverleaf Cotoneaster is a semi-evergreen shrub, up to 2 m tall. Flowers are borne in corymbs 1-3 x 1.5-2.5 cm, up to 10-20-flowered; axis and flower-stalks densely woolly. Flower-stalks are 2-3 mm. Flowers are 7-8 mm across, sepal-cup bell-shaped, below densely woolly. Sepals are triangular, tip shortly tapering or pointed. Petals are spreading, white, broadly ovate or nearly round, 3-3.5 mm, base shortly clawed and finely velvet-hairy above, tip blunt. Stamens are 20, nearly as long as petals; anthers purplish red. Branchlets are dark grayish brown or purplish brown, thin, initially densely white woolly, becoming hairless. Leaf-stalks are 27 mm, woolly; leaf blade narrowly elliptic, elliptic, or ovate, 2-3 x 0.8-1.5 cm, leathery, lateral veins 4-6 pairs, below densely white woolly, above slightly velvet-hairy or hairless, base broadly wedge-shaped, tip blunt or pointed. Fruit is dark red, spherical or ovoid, 7-8 mm in diameter. 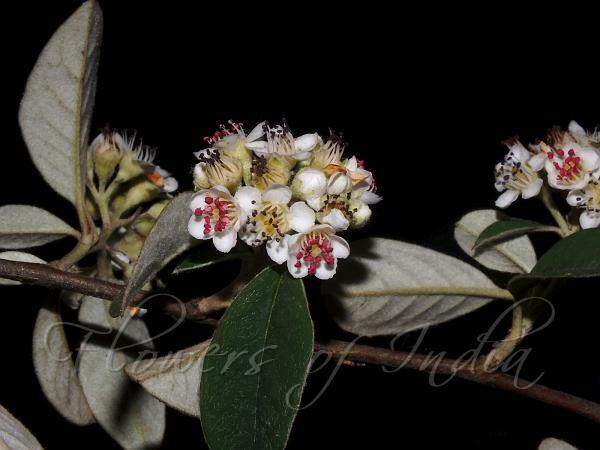 Silverleaf Cotoneaster is native to China, cultivated as a garden plant. Flowering: June-July. Identification credit: Nidhan Singh Photographed in Llyods Botanical Garden, Darjeeling.